I know that tomorrow is Thanksgiving, but Sunday is the first day of Advent. As per my tradition, each year I spend time translating from the Greek New Testament some of the Advent readings. I do this for many reasons but now as I am a full-time writer I do it as a writing exercise. Translating is a different kind of writing, but it is an important skill in wordsmithing. By the way, wordsmithing apparently is not a real word but it should it be. Where do I get these readings? Do I make them up on my own? No. They come straight from the most universally accepted source for daily Bible readings–the Book of Common Prayer. Most people would think these are readings about the birth of Christ. But no, they are not. These are readings, almost invariably each year, are about Jesus’ second coming and that is an important Advent theme. Just as Christ came into the world once, he promised to come again. Usually this means I end up translating the spooky Olivet Discourse from the gospels. But the last two years I have done the readings from the epistles. 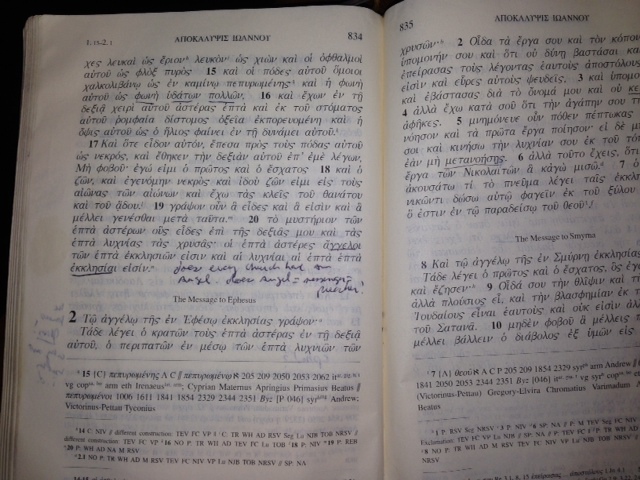 For 2013 I have translated the daily readings, year two, Monday-Saturday on the epistle ledger. For this year that means our readings are from 2 Peter, Jude, and Revelation. That’s right. I have translated for you the first six chapters of Revelation. I know, the excitement is more than I can take. I am not really into the doom and gloom, but these passages are a powerful call to us in the midst of great materialism to consider what exactly are the things that will last once this earth passes away? Here is a clue: It will not be anything you get from standing in line at a Black Friday sale. My translation theory is pretty simple. I seek to keep subjects and verbs close together and I attempt to translate a word the same away every time it appears. In addition I like to use gender inclusive language because that is the way I understand plural words such as “adelphoi” or “anthropoi” in their common usage. It is also important to me to be as faithful to the text as possible but, and here is the slippery tricky wicket, to make the meaning clear to the modern ear. The ancient Greeks and Jews thought about life and things differently than we do and to convey their meaning sometimes means playing around with words. What I would like for you to do–and I mean this–is to maybe use these translations as a reading schedule for your personal Advent devotions. They are broken down day by day (I will post each week) and take you up through Christmas Eve. There are no Sunday translations because you should be at worship that day reading your church’s lections. I have included some interpretative notes in italics beside some of the verses. I just couldn’t help myself. If you don’t like my renderings, please toss them and read instead from a really good translation like the ESV or the NRSV. However, I have found that these renderings, made by committee, often do not reflect the actual intent of the text but instead reflect the theological ideology of the group of people putting it together. But I digress. When you’re reading week one, note that it is not me that skipped Chapter 2 of 2 Peter, but the lectionary. I don’t know why, but I followed their lead. 1. From Simon Peter, a servant and apostle of Jesus Christ, to those who are equally allotted faith by the righteousness of our God and Savior Jesus Christ. 2. May grace and peace be multiplied to you in the knowledge of God and our Lord Jesus Christ. 3. Whose divine power gives us life, godliness, knowledge, and purpose for his glory and virtue. 4. Through whom he has given the greater gifts of honor and promise, so that you might become partakers with the divine nature, escaping the corrupt desires in the world. 7. godliness with brotherly love, and brother love with unconditional love. 8. For these gifts are increasingly yours, not so that they might make you useless or fruitless, but for the knowledge of our Lord Jesus Christ. 9. As for anyone in whom these gifts are not present–he is blind, closing his eyes, oblivious of the fact he received cleansing of his old sins. 10. Therefore, all the more, brothers and sisters, you must be firmly diligent, making certain of your calling and election. Anyone who does will never stumble. 11. and entrance will be richly supplied into the eternal kingdom of our Lord and Savior Jesus Christ. The ladder of virtues pushes us forward in our spiritual walk, and verse 8 is a warning. We do not grow toward agape “unconditional love” so that we can be useless or content but so that we might know Jesus better. Think about this as the goal of the Christ-followers life–to know Jesus better. 12. I intend to remind you about these things, even though they are known and confirmed in the truth that has already come to you. 13. Now I consider it right for as long as I am in this tent–this temporary dwelling–to awaken your memory. 15. I will be diligent, now and always, that after I have my exodus you will remember these things. 16. For it was not subtle myths that you chased, but it was the power and presence of our Lord Jesus Christ made known to you. You have been made spectators of that greatness. 18. This is the sound we ourselves heard from heaven when we were brought to be with him on the holy mountain. 19. And, even more reliable, we have the prophetic word that you would do well to hold onto. It is a lamp shining in a dark room until the day dawns, when the morning star rises in your hearts. 20. Knowing primarily, that all prophecy, all scripture, is not a matter of personal interpretation. 21. For prophecy was not developed by the will of people but people spoke as they were moved by the Holy Spirit. Two notes here–one is the word play with “tent” that Peter uses. For him it is a metaphor for his body and uses it to speak about his impending demise. However, the linkage between tent as Tabernacle in the Hebrew Bible and his usage of the word “exodus” in verse 15 reminds of the constant New Testament analogy of Jesus leading us to a promised land out of slavery. Also notice that Peter seems to indicate that the scriptures, the Hebrew prophets are more reliable than his own eyewitness account of what God did. Think about that for a little while as a contrast to how we almost always make texts bend to match our own experiences. 2. to remember the words that have been spoken beforehand by the holy prophets and the commandments of the Lord and savior given to you by the apostles. 6. Likewise, through water, the world was destroyed, flooded. 7. But now the heavens and earth are preserved for fire by the very same word of God. They are kept for the day of judgment and the destruction of godless people. 8. Now, do not let this escape your notice, loved ones, that one day with the Lord is like a thousand years, and a thousand years are like a day. 9. The Lord is not slow with these promises, as some think of slowness, but he takes a long-term view among you, not wishing anyone to be destroyed but instead making time for everyone to repent. 10. Now the day of the Lord will arrive as a thief, the heavens will pass away with a rushing noise but the elements, being burned, will dissolve and the earth and all its works will be found out. 11. Since everything is being dissolved anyway, what kind of people should you be in order to live holy lives in godliness? 12. Waiting, being hurried even, for the coming day of God when the heavens will be set on fire, and the elements will dissolve, melting as they burn. 13. For now we wait expectantly for his promise of new heavens and a new earth where righteousness lives. 14. Therefore, loved ones, while you await these things be eager to be found spotless and unblemished by him, in peace. 15. And consider the long-term view of our Lord as a salvation, just as our beloved brother Paul wrote to you about, according to the wisdom that has been given to him. 16. And as in all his letters, speaking in them about these things, some of which are hard to understand, and unlearned and unstable people distort, just as they do other scriptures to their own destruction. 17. You, therefore, loved ones, know ahead of time to be on your guard so as not to be lead away together in unprincipled error and to lose your own stability. 18. May you now grow in grace and knowledge of our Lord and savior Jesus Christ: To him be glory now and on the eternal day. Amen. The phrase “long-term view” that I use is usually understood as the ‘patience’ of the Lord. There is nothing wrong with that, but I think what Peter is trying to communicate here is that the Lord sees more than the temporary. He sees further down the road and therefore holds out hope for people’s repentance. We too should have a long-term view in our personal lives and in the ministries of our churches. If churches took longer-termed views then perhaps we’d have more stable churches with a lot less debt. 1. From Judas (aka Jude), a servant of Jesus Christ and a brother of James to those called by God the father, having been loved and kept for Jesus Christ. 2. May mercy, patience, and love be multiplied to you. 3. Loved ones, with a lot of excitement I prepared to write to you about the savior whom we have in common, but instead I now have found it necessary to write urging you to strive for the faith entrusted to the saints. 4. Some people sneaked in, as written to you beforehand, who long ago earned God’s judgment on the godless, those who transformed grace into debauchery and disown the only ruler, our Lord Jesus Christ. 5. Now I want to remind you what you already know: The Lord, once having saved people from the Land of Egypt afterward destroyed those who did not believe. 6. The angels who did not keep to their own realm but abandoned their own dwelling, he kept them in perpetual chains of gloom until the great judgment day. 7. Sodom and Gomorrah and like-minded cities nearby fornicated and chased after unnatural sensuality, as is evident because they set before an eternal fire undergoing punishment. 8. Those like them, nevertheless, dream of sexual defilement, reject authority and blaspheme glory. 10. But on one hand these people blaspheme, but on the other hand they act instinctively like wild animals and as such they destroy themselves. 11. Woe to them, for they wish to travel in the way of Cain and in the error of Balaam, all for a reward, and they themselves abandon obedience and are destroyed in Korah’s rebellion. 12. These people are blots on your love feasts, eating without conscience and shepherding themselves. They are waterless clouds carried along by winds. They are trees in season but barren, being uprooted and therefore doubly dead. 13. They shame themselves, wild waves foaming the seas, wandering stars, which, in this age, have been kept in gloomy darkness. 16. These are grumblers; they are disgruntled; they are against everything; they follow their own desires. Jude is not happy with his audience. He wanted to write them something sweet and uplifting, but instead he felt like he had to hammer away at them. The language here is very spooky as he references all the punishments of old. My favorite is the idea of these evil people becoming ‘wandering stars kept in gloomy darkness’ no doubt referencing comets or meteors. 17. But now, loved ones, please remember the words that have been spoken by the Apostles and our Lord Jesus Christ. 18. and what they said to you, that at the end of time, there will be mockers, following their own ungodly desires. 19. These spiritually empty people are those of the same type as those who divide. 20. But you, loved ones, build yourselves firmly in the most holy faith, praying in the Holy Spirit. 21. Keep yourselves in the love of God, waiting for the mercy of our Lord Jesus Christ in eternal life. 22. Likewise, show mercy to those who are doubting. 23. You must save others, snatching them from the fire, show mercy yourselves, with love, hating the flesh as if it were a dirty shirt. 25. to the only God, our savior, through Jesus Christ our Lord, be glory, majesty and might. As it was before all ages, so be it now and forever. Amen. Read for Week Two? Click here.